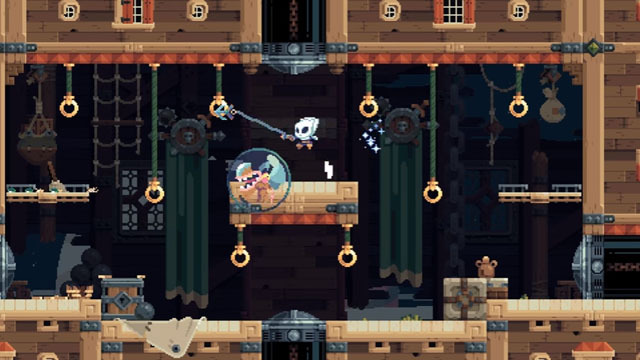 Flinthook is a procedurally-generated grapple-based platformer from Tribute Games, the studio behind a number of pixellated actioners: Wizorb, Mercenary Kings, Ninja Senki DX, and Curses 'n Chaos. In this game, you use a grappling hook to swing around the environment, dodging lasers, saw blades, projectiles, and spikes, while also contending with a number of enemies. Fortunately, you have more than just a grappling hook to see you through, as you can blast away at foes, toss explosives, and even slow down time a bit in order to line up a kill shot. Some exploration is required as well, as rooms are interconnected, requiring the player to seek out keys and do a bit of backtracking to track down treasure chests. There are also a number of boss encounters that require deft use of your projectiles and grappling abilities, as you fly around the room, connecting to grapple points and aiming for the boss' weak point. The game is headed for Xbox One via XBLA and PC via Steam later this year.